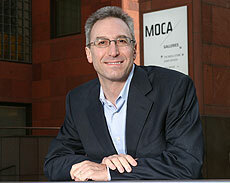 Jeremy Strick, director of the Museum of Contemporary Art in Los Angeles, will join UCSC alumni from the art world for a panel discussion. • Philip Brookman (Porter '75), Senior Curator for Photography, Corcoran Gallery of Art, Washington, D.C.
• Karen Moss (Porter '77), Curator at the Orange County Museum of Art, Newport Beach, California. • Gordon Knox (College Eight '78), Director, Lucas Artists Programs at Montalvo Arts Center, Saratoga, California. Discussion of plans for a new arts space at UCSC began in the Arts Division during the 1990s. An Executive Planning Committee was appointed in 2003 to create a strategic plan to build a new museum, and a museum consultancy firm was hired to guide the planning process. Last year, a plan was completed which outlined the steps to make the Center for Art and Visual Studies a reality. Gonzalez said that the goal of the panel is to create awareness of the proposed arts center and show how it would transform educational opportunities for the Arts Division, as well as the campus at large. She noted that an art museum is much more than just an amenity for those who study art or visual culture. “As a scholar of art history and visual culture, I consider an art museum entirely related to teaching and research,” said Gonzalez. “How can a marine biologist study sea life without an aquarium or water tanks in a laboratory? How can art history students study art practice without art objects? This is a great time to create a laboratory space that has its roots in the traditional art museum, but includes contemporary visual arts and technology,” she added. Gonzalez will serve as moderator for the panel, which will take place on Saturday, April 22, from 2:30 to 4:30 p.m. in the Bhojwani Dining Room at the University Center. Admission is free and open to the public. For more information, call Ann McCrow at (831) 459-2439.